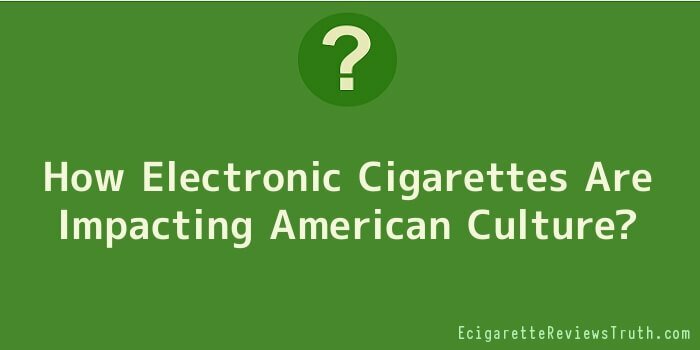 How Electronic Cigarettes Are Impacting American Culture? A few years ago, consumers seemed to be smoking less, or at least, they knew better than to smoke around their kids. Society frowns upon smoking in public. The very act of smoking seems out-dated, but that is because it takes place behind closed doors, in personal vehicles, and in isolation or with other smokers. Unfortunately, what seems like a dying habit continues killing people around America. Since the time when addiction to nicotine and diseases related to smoking were first documented, solutions have arisen to help smokers give up cigarettes. Some have come from alternative medicine: hypnosis, acupuncture, and meditation. Western methods include chewing gum, wearing patches, getting shots, and counselling. Numerous people give up smoking by simply quitting and willing themselves never to go back to smoking. Recently, another method has arisen: vaping. This term refers to using an electronic cigarette to inhale vapour. While routine movements (putting a pen-shaped object to one’s lips, puffing, and blowing out “smoke”) remain the same, there is one crucial difference. That is not a smoke ring your neighbour is making but a vapour ring, and his “cigarette” is actually a battery-powered device. Since electronic cigarettes were first introduced, a remarkable change has overcome the smoking public. Numerous reviews touch on the benefits of choosing a particular brand, but the real story is how an electronic cigarette helps people quit smoking. This is still a highly debated topic, with the lack of years of scientific evidence, but there are researches studies appearing that are offering their observations through various trials and testing. Countless individuals have written to forums, to the companies who sell electronic cigarettes, and to other smokers to say that inhaling vapour instead of burnt chemicals has given them a chance to take a deep breath for the first time and enjoy the flavours in their food. Among their number are individuals who were in hospital being treated for smoking-related illnesses. Their conditions were so severe they used inhalers every day and could barely climb a flight of stairs. Today, several of these Americans are now exercising regularly, no longer suffer from breathing problems, and their doctors are amazed at their progress. It’s no secret how they accomplished a 180-degree turn: electronic cigarettes helped them do it. That being said, they are not FDA approved smoking cessation devices. These are the claims and experiences of those individuals, and are worth researching for you. In spite of the many laudatory articles written in favour of electronic cigarettes by consumers and manufacturers, a party of unbelievers has emerged. They are cautious, and rightly so. The potential for problems to arise is unknown at this time. The industry is so new that there has been little in the way of scientific research conducted in an effort to prove the safety or danger of vaping. Meanwhile, getting rid of combustion does not take away one of the primary reasons for fearing cigarettes: nicotine. This is an addictive drug; an insecticide. It affects the brain much the same way other drugs do. One becomes so reliant upon nicotine that trying to go without it for a sustained period of time causes physical and emotional pain. On the plus side, electronic cigarettes are available with zero nicotine. On the down side, most disposables come with nicotine. Customers can buy rechargeable kits and refills without this drug, but individuals who would never have considered smoking will choose e-cigs believing them to be safe. In reality, they are better than cigarettes but that does not mean they are 100% safe. If a child decides it would be great to vape, a child who thinks cigarettes are disgusting and would never try one, he could still become addicted to nicotine. Worse still, many electronic cigarette companies make disposable e-hookah pens which taste like sweet things: fruits, chocolate, and cocktails. These are unbearably tantalizing. Even though they should not be sold to minors, the same is true of alcohol and cigarettes which still find their way into teenagers’ hands. Other companies have moved on and are producing electronic cigarette that create huge amounts of vapour, these product are known as sub ohm tanks. As you can see, enforcing the law around anything prohibited does not make it less desirable (in fact, that makes kids want it more); nor does the law prevent children from obtaining e-cigs, cigarettes, and other substances. There is always a way; always some adult willing to help a kid out or a clerk happy to turn a blind eye. If not e-cigs, then children would get hold of something else. As for cigarette smokers, they now have a choice. They can vape, smoke, or just quit. When they switch from smoking to vaping, a miraculous thing happens: they save money. Now they have more spare cash to spend on doing things they couldn’t do before because they ran out of breath so quickly. A number of websites document the potential savings consumers can enjoy by comparing the price of a packet of cigarettes to the equivalent in e-cigs (each e-liquid refill amounts to so many cigarettes). By filling out the savings calculator, customers discover how much they have spent in the past year and how much they will save in the coming year. Even if these figures are inflated, there is merit in the claim that by switching to electronic cigarettes, smokers will be able to save money. In every industry, there is the language of “going green.” Consumables come in recyclable or biodegradable packaging. Products are made from sustainable resources or from recycled materials. E-cigs fit into the category of “green” products on the one hand, but fail in another respect. E-cigs produce a lot of e-waste. Though batteries can be recycled, other e-cig parts are not accepted at local recycling facilities. Butts and toxins are being kept out of landfills and the road side, but flavour cartridges and packaging take their place. Companies selling electronic cigarettes try to solve this problem by encouraging efforts to recycle old batteries, and one company even accepts used cartridges. These firms offer a place to return items or direct consumers to the nearest facility. In some cases, loyalty points or rewards are offered to customers who return used products. E-smoking or vaping is still an addiction. It is not a good habit because no habit that becomes reliance is positive. Yet, if you feel helpless to give up smoking, replacing cigarettes with e-cigs appears, on balance, to be a good trade.